Top of the World third grade students were recently given important historical figures to research and present in a living history museum. Students dressed as Albert Einstein, Malala Yousafzai, Elvis Presley, Vincent van Gogh, and J.K. Rowling. The project culminates with a museum that family members and staff are invited to so that students can share everything they’ve learned. On November 17, the LBHS Boys and Girls Cross Country teams dominated at the CIF D4 Finals, both advancing to the State Finals to be held in Fresno tomorrow (Saturday). Way to go, Breakers! Front Row: (L-R) Sierra Read, Angelina Dyrnaes, Molly Cohn, Morgan Falkowski, Kaitlin Ryan, Jessie Rose, Audrey Sutton, Hannah Konkel, Emily Engel, and Sydney Schaefgen. Back Row: (L-R) Ryan Smithers, Cal Nielson, Timmy Crawford, Will Compton, Mateo Bianchi, Zach Falkowski, Logan Brooks, Daniel Kimball, and Gabe Neff. LBHS Boys Cross Country was crowned the CIF D4 Champions on Saturday, recording the fastest team time in CIF D4 history. Ryan Smithers was named D4 Champion, and is the fastest cross country runner in LBHS history. Logan Brooks is the fastest junior and Mateo Bianchi the fastest sophomore in LBHS history. The team will head to the California state finals this weekend at Woodwark Park in Fresno. On Tuesday, Nov27, the Boys & Girls Club of Laguna Beach will join #GivingTuesday, a global day of giving that harnesses the collective power of individuals, communities and organizations to encourage philanthropy and to celebrate generosity worldwide. 92Y, a cultural center in New York City, conceptualized #GivingTuesday as a new way of linking individuals and causes to strengthen communities and encourage giving. Last year, millions of people in 98 countries came together to give back and support the causes they believe in. Over $274 million was raised online to benefit a broad range of organizations, and much more was given in volunteer hours, donations of food and clothing, and acts of kindness. For more details about the #GivingTuesday movement, visit the #GivingTuesday website at www.givingtuesday.org, Facebook page at www.facebook.com/GivingTuesday, or follow @GivingTues and the #GivingTuesday hashtag on social media. The #GivingTuesday donation platform is available at www.bgclagunabeach.org and ready for contributions now through November 27. After 12 years on the Laguna Beach Unified School District’s Board of Trustees, Ketta Brown has retired. 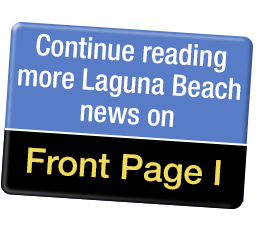 Brown joined the board in 2006, after more than 13 years of dedication to Laguna Beach schools including work with Laguna Presbyterian Preschool, Friendship Shelter, TOW Elementary, Thurston Middle School and LBHS. The nutrition services supervisor, Debra Appel, led a Board Study Session on school nutrition services in the Laguna Beach Unified School District; click here to learn more. Throughout the last several years, the nutrition services department has been introducing new made-from-scratch recipes that feature more whole grains, fresh fruits, and vegetables. Unlimited salad bars with organic fresh fruits and vegetables sourced from local farms are available with every school meal. After going winless last season, the LBHS Girls Basketball team, led by coach Matthew Tietz, is off to an impressive 4-0 start to kick off the 2018-19 season. The team kicked off its winning season with a 58-11 victory over Public Safety Academy Monday at home. The game was won on great team defense that held PSA scoreless in three of the four quarters and by a balanced scoring attack, which saw 8 of 10 players score. Leading the way for the Breakers was freshman shooting guard Anna Cheng, who filled out the stat sheet in her first ever high school game leading with 16 points and adding 7 rebounds, 4 assists, 5 steals and 3 blocked shots. Junior forward Madi Garwal added 9 points, 8 rebounds and 4 assists. Junior center Julia Henry scored 12 points, with 9 rebounds and 3 blocked shots. Senior point guard Mia Pitz scored 9 points, with 7 assists and 4 steals. 7 of 9 players scored led by Mia Pitz with 13 points and 5 assists. Madi Garwal added 11 points and 12 rebounds. Anna Cheng scored 11 points and had 9 steals. Autumn Moreland dominated the key with 15 rebounds. Game number three was “an ugly mess” according to Coach Tiez, but the team still pulled out a win, 26-23 in overtime against Santa Rosa Academy on the road. The team missed its first 21 3-point attempts on the game and made just 9 out of 63 shots from the field overall. “In a game where the bounces didn’t seem to go our way and everything that could go wrong went that way, our girls continued to fight and never gave up,” said Coach Tiez. Anna Cheng hit a 3-pointer to open up the overtime and Madi Garwal hit two free throws to ice it. Top performers included freshman Autumn Moreland with 22 rebounds on the game, Madi Garwal with 15 rebounds, Julia Henry with 5 blocked shots, Mia Pitz with 6 points, 6 steals and 4 assists, and Anna Cheng with 7 points. The Breakers girls notched their fourth consecutive win last night (Thursday), defeating Calvary Baptist 45-8. Leading scorers were Anna Cheng with 18 points, including four 3-pointers, and Mia Pitz with 10 points. The team travels to Palm Springs today (Friday) to face Desert Chapel at 4 p.m. on the road. LBHS defeated Northwood High School 34-13 in the CIF Quarter Finals on Friday. QB Andrew Johnson led the way again for the Breakers, throwing for 315 yards and 4 TDs on the game. Johnson and receiver Sean Nolan have broken almost every LBHS record for their respective positions this season. LBHS (10-2) will face Artesia (9-3) on the road in Lakewood on Friday in the CIF Semis. With a win, the Breakers will host the CIF Division 11 Championship at home the following weekend at Guyer Field. The agenda for tonight’s (Tuesday, Nov 13) regular LBUSD Board meeting has been posted online here. Open session will begin at 5 p.m. The agenda includes a special study session on the school nutrition program. A reception to honor retiring Board member Ketta Brown will immediately follow at approximately 5:40 p.m. The regular business meeting will begin at 6 p.m. The Board will receive information about the 2019 SchoolPower Fund-A-Need and a report on developer fees. Action items for Board consideration include the appointment of two Board representatives to the College and Career Advantage Board, approval of a resolution approving an employee retirement incentive, and approval to purchase research databases for students and a subscription for ParentSquare communication system. The LBHS Girls Tennis team continued its dream season on Wednesday, upsetting the number one seeded team in the CIF playoffs, Wilson High School, 11-5. “In doubles, Megan Mindte and Vanessa Gee led the attack with aggressive play to take all three of their sets. Jessa Chaney and Camille Deckey added an additional two set contribution to this victory by attacking their opponents relentlessly. “Hana Beri and Cosette Basto battled to the end with long baseline rallies that weakened early round opponents. The team’s final match, the CIF Division 3 title match against Huntington Beach, begins today (Friday) at 1 p.m. sharp.